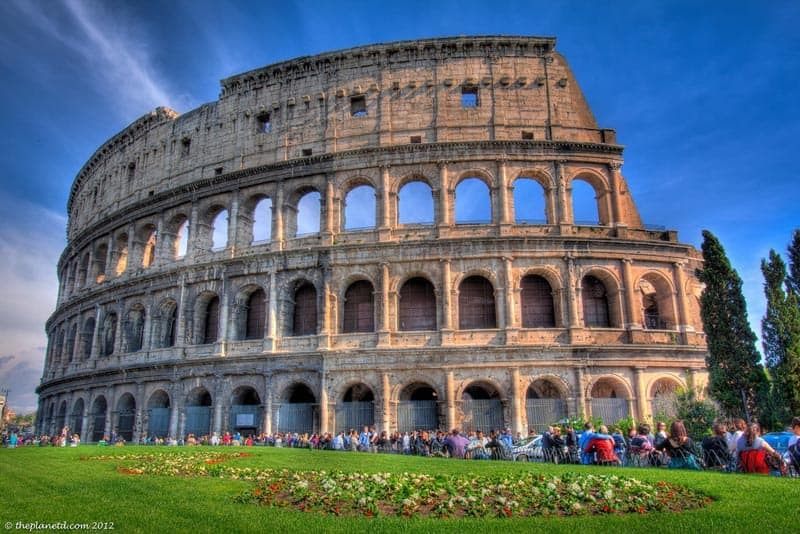 Rome is a fascinating city dating back thousands of years. We took a stroll around the ancient ruins to capture these amazing Rome pictures. Enjoy! The Trevi Fountain is crowded, dirty and loud during the day, but when we took this photo of Rome at night, there was nobody around. It was midnight and we had the Trevi Fountain all to ourselves. It's difficult to make out what the Roman Forum is during the day, it almost seems like a mess of ruins, but at night, when it is lit up and free from crowds, you can see the grand beauty. We were lucky enough to stay right across the street from the Colosseum of Rome. We had different perspectives throughout the day and night. This Rome photo was taken while picnicking on the grassy clearing. The Vatican is another place overrun with tourists. But we took a Vespa Tour of Rome and stopped by the square. There was absolutely nobody there. The Pope's light was one showing that he was home and we waved hello. The Pantheon was a really cool spot. To give it an ancient feel, I wanted to do some crazy processing. I feel that this Rome image transports me to 1000 BC and whatever God they worshipped then is looking down over the ancient structure. I know most of my Roman history from movies. So when seeing the Marcus Aurelius statue, Gladiator came to mind. It was another impressive sight that we had all to ourselves at night. The Vittorio Emanuelle II Monument stands at a busy roundabout. With a long exposure, I could capture the impressive building by blurring the cars driving by. The Protestant Cemetery of Rome is a tranquil place of peace and relaxation to get out of the hustle and bustle of the city. This tombstone is the first of its kind but has been replicated at cemeteries all around the world. 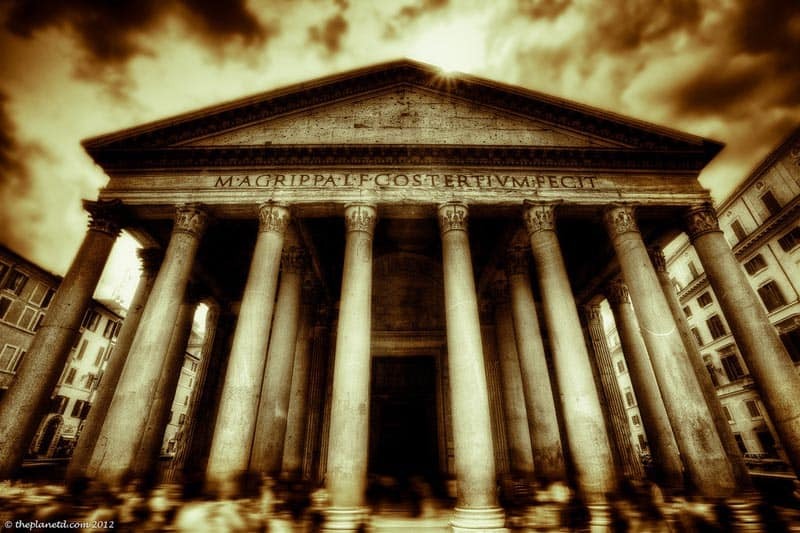 72 Responses to "Ancient Rome in Photos"
Great Photos! Rome is a beautiful city. My dream is to go there again and again. Thank you for Sharing photos. 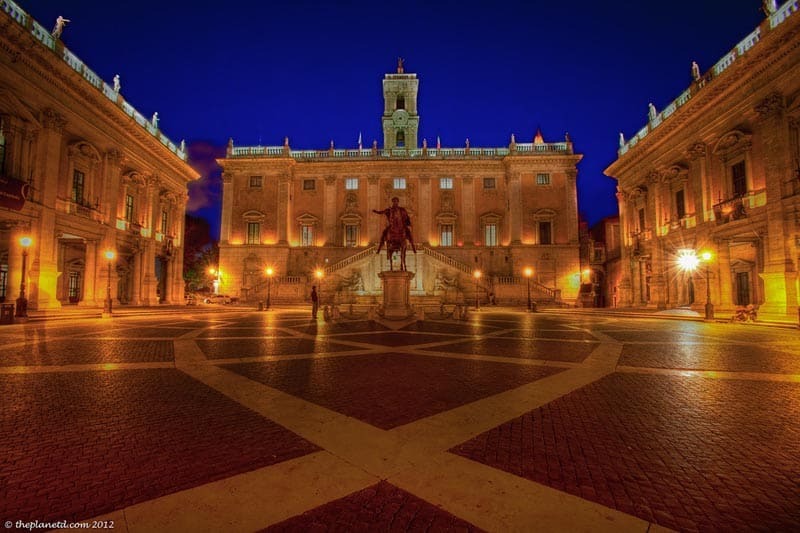 Oh wow, some amazing photographs here – I love rome! Thanks Surminga! We love rome too! Traveling to Rome in August. These pictures have me even more excited to go now! So beautiful! i don’t know real Rome shows like that or not…. 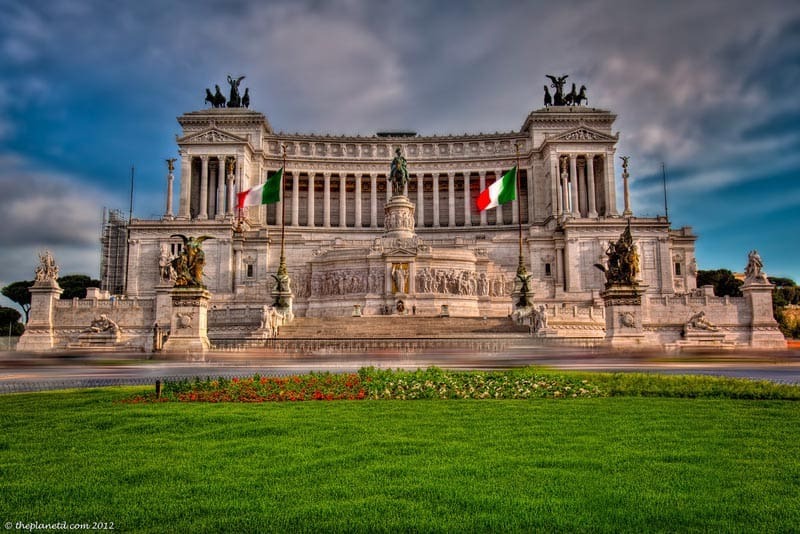 Excellent photo of the Vittorio Emanuele II Monument in Rome. St. Peter’s Basilica, the Pantheon, the Equestrian Statue of Marcus Aurelius? Very good. The Trevi Fountain is wonderful, but it had problems recently! The Colosseum and the Roman Forum are amazing. I especially love the one of the VE II monument, the flags and matching plantings – troppo bello! Beautiful photos! Rome is one of my favorite cities. I think these are the best photos I have ever seen on your blog! Awesome! These images are intriguing and somewhat regal, fantastic to look at! 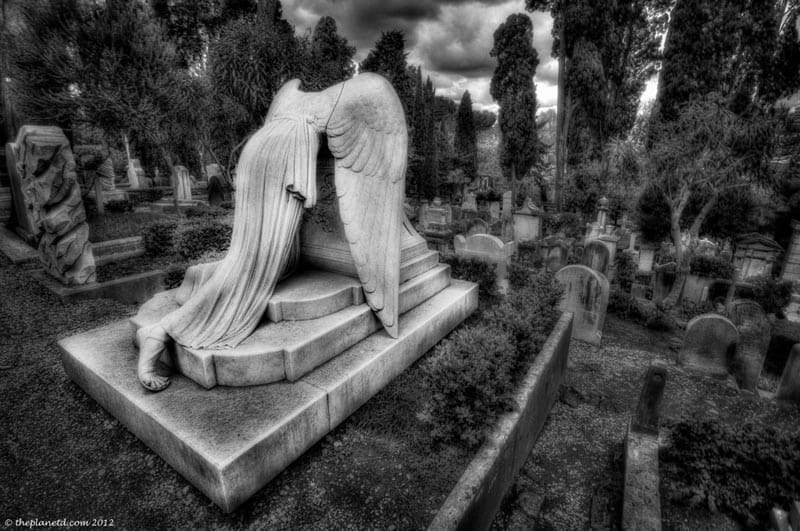 My favourite image is ‘The Watchful eye in the Non-Catholic Cemetery in Rome’ her long wings and the fact that she is headless is very unique in comparison to the other headstones. Thank you Loco2. I think that this is the most captivating piece for sure. We were told that she has been replicated all over the world. There is actually a head there, it is just dangling very low. Dave chose to take the photo from this angle, it does make for a very captivating shot. Great photos I appreciate their qality. Keep working so fine thanks for sharing ! Thanks Sergio, so glad you stopped by for a look. Wow! Awesome photos. Makes me want to get to Rome more than ever. Oh, and buy a good camera. Thanks a lot for your wonderful photos. Came over once again and I am still mesmerized by the shots. Really Awesome!! All I can say is… WOW! 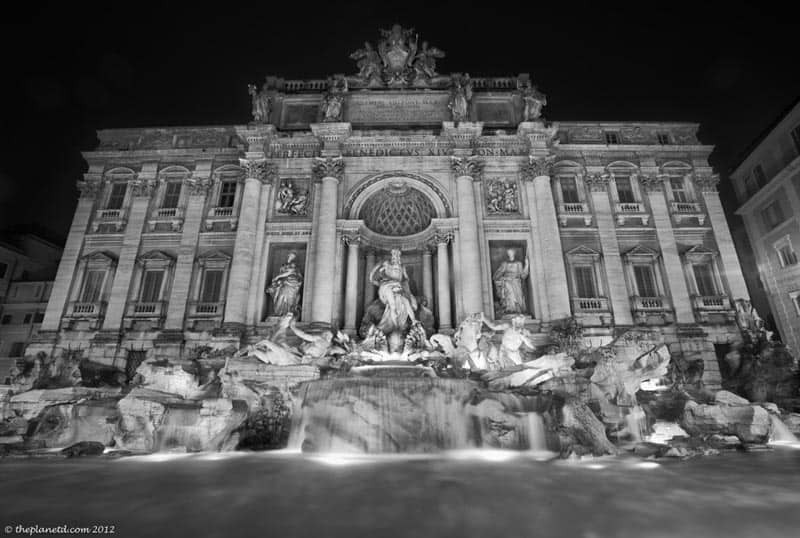 I never thought the Trevi Fountain would look so good in black and white. Plus that angel cemetery shot is stunning. Great shots. We didn’t have time to visit Rome on this trip to Italy since we have both been there before, but I know we will be back. We stayed at a pretty awesome hostel there while in transit though. I’ve seen better… not. Amazing pictures Dave. Hopefully it will be as beautiful in real life when we are there next month. Going to have to learn some tips from you some day soon! 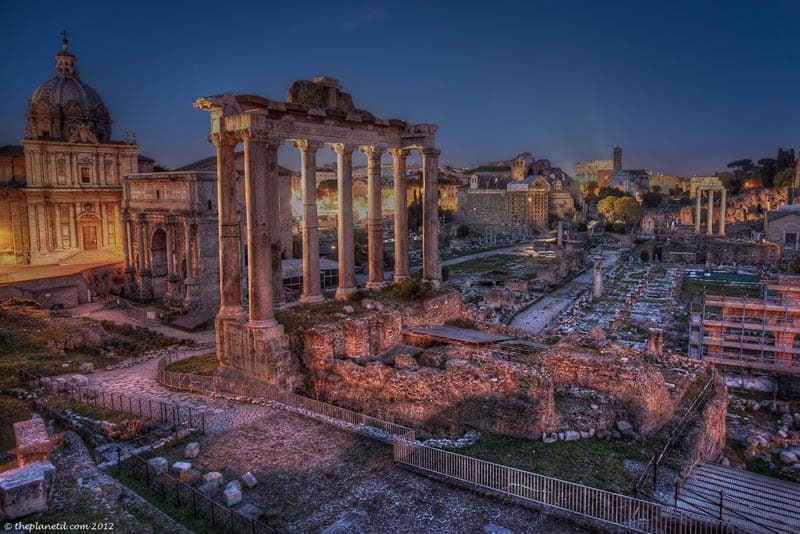 Fabulous pics, makes me desperate to go back to Europe and Rome! Those non-Catholics have a kickass cemetery!! Awesome pics! We feel you! Despite our best intentions we fell in love with Italy as well. Damn it, Europe. Why can’t we quit you?! Just wonderful shots! Each shot is so lively, looks so real. Great skills!! Thanks for sharing. Great Rome..i love all of these photos..thanks for sharing this informative post for me.. Absolutely amazing photos guys. Is there somewhere you run through your equipment and post processing techniques for shots such as these? I’m wondering if you could make my home time of Swindon, England, look as attractive as this too?! Hey Will, I used long exposures and a 6 stop ND filter for the Trevino Fountain to get the smooth water effect. All on a tripod of course. Beautiful! REally beautiful photos Dave!! Amazing photos! What a great opportunity for traveling photographers such as yourselves. Stunning pictures of my favorite places. Thank you very much! nice post..i love all of these photos..thanks for sharing this informative post.. Incredible photos Dave. Love the Roman forum in particular, great work! Wow, I just recently went through my old photos from Rome and these put them to shame. Amazing photography as always! I want to go back now! Thanks Dean. That’s the great thing about Rome, there is always so much more to see with each visit. So wanna go back to Rome now! Great pictures!!! How do you do it? Incredible! And considering how many photos I’ve seen of Rome these feel like a fresh take on the city. Thank you Leigh, that is a huge compliment. Rome was a very inspiring city. I only wish I had more time there and better weather. But then again, I’d have too many photos to choose from if we had too much time there. 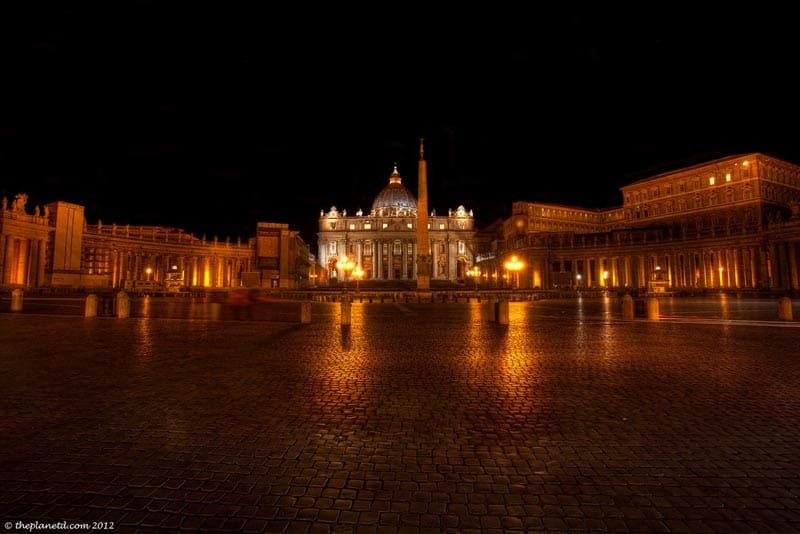 Stunning photos, you have truly captured the beauty of Rome. Thanks Michelle. It’s a beautiful city. Wow! I’m so glad I threw in extra coins in the Trevi the last time we were there. I want to go back already. Stunning photos! I agree, I want to go back too and we only just left a week ago! WOW!!!!!!! These pictures are just incredible. AMAZING photos, but my favorite is definitely the Trevi Fountain – wonderful new perspective on it. Wow, thanks John. The best time to take a photo of the Trevi Fountains was at night. It was so crowded during the day, but after midnight, it’s nearly deserted.